Constantine died in Nicomedia in 337 after a short illness. He had lived to 64, a good age for the time. The death of Constantine ended one of the longest reigns in the history of the empire. His death came just after he had celebrated his thirtieth year as emperor, something only Augustus had previously achieved. It was fitting that he was buried in Constantinople, the city he founded. Lars Bronworth started his 12 Byzantine Emperors podcast series with Diocletian, but Constantine is usually seen as the founder of the Byzantine empire. This is a reasonable enough thing to do. There really was no longer anything particularly Roman about the political entity Constantine had ruled and the move of the capital to the east marks a clear change of focus and direction. To describe this as a new empire with a new name fits well enough and helps us to make sense of the complexities of this period. But the people at the time would not have been aware of this change. A new emperor could just as easily have moved the capital back to Rome after all. The reign of Constantine is one of those turning points that only become clear later. In the meantime, the people on the ground had more compelling matters on their mind. The principle question would probably be how the post Constantine government was going to work. Was Constantine’s idea of handing over to five (count them) five successors going to work? Constantine had died in Nicomedia in the jurisidiction of Constantius, who had got the best provinces in the will. He was in charge of the East which was where the money was. It was also where the action was because a major war with Persia was underway. 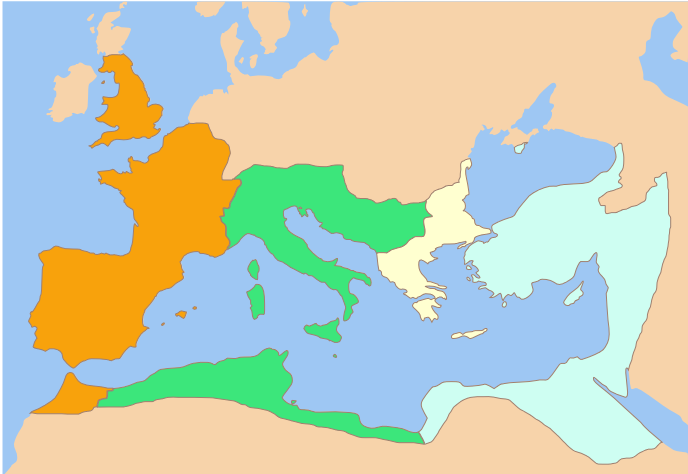 Dalmatius and Hannibalanus were in Constantinople but could not establish their authority. They were quickly seized by supporters of Constantius. When he arrived in the city with his father’s body he quickly ordered them to be killed along with their family. This had the effect of simplifying the somewhat complex dynastic situation, which is good if you are trying to give a clear account of the time. But the aim wasn’t to make life easier for future amateur historian. It eliminated possible rivals from the succession. This meant that the empire was now divided between the three sons of Constantine all of whom were extremely young. The potential for problems was obvious and gives us one of those laugh out loud quotes you come across from time to time in Decline and Fall. After the partition of the empire, three years had scarcely elapsed before the sons of Constantine seemed impatient to convince mankind that they were incapable of contenting themselves with the dominions which they were unqualified to govern. People just don’t write like that anymore. It is both funny and accurate. The oldest son was Constantine II who had been allocated Britain, Spain and France. This was a large chunk of the empire in terms of area and came with some pretty handy legions used to fighting on the perilous German and Scottish borders. But it was a relatively undeveloped and non-prestigious portion. Constans got Italy and Africa and a big chunk of the Danube border. He also acquired most of the big chunk of what Dalmatius was supposed to have got in the Balkans. So he had a better patch than his older brother Constantine. But Constans wasn’t yet an adult, so Constantine was his legal guardian. This set the stage for a classic bit of sibling rivalry which they soon provided by the inevitable disagreements about how big their share of the imperial pie was. They obviously wanted to sort it out amicably and tried rearranging their borders. But they couldn’t find a settlement that suited both of them – though I dare say the views of the advisers around Constans probably played a fairly big role too. In the end Constantine ended up invading Italy to sort it out by force. He was following the pattern of his father and might well have succeeded, but by chance he happened to get caught up in a skirmish where he was killed. His one time supporters transferred their allegiance easily to that of his brother, so at a stroke and with relatively little fighting Constans became the master of two thirds of the empire. His precise age is uncertain, but he was probably about 15. I imagine that he was simply a figurehead at first. He was to rule for 13 years despite his youth making him far from ready for the job. Constans as the youngest of the three sons of Constantine would have had the least opportunity to benefit from any training from his father. Nobody else would have dared to help the young prince with the kind of advice you badly need to be an autocrat. But whatever the reasons, and however excusable given that he hardly chose to be who he was, Constans got a bad press as a ruler. He was vigorous enough but was prone to favouritism and cruelty. His homosexuality may have been a problem too. Christianity was continuing to increase its influence and it may be that homosexuality was already starting to be considered to be sinful in its own right. But even prior to this Roman attitudes to sexuality were not as liberal as they sometimes seem. Cavorting about with a bunch of barbarian pretty boys selected from some prisoners of war -as Constans did – was not behaviour consistent with the dignity of an emperor of Rome. But nonetheless it isn’t very likely that his overthrow was down to public disapproval so much as to the ambition of one of his generals, Magnentius. I think the most likely explanation of events is that Magnentius had been used to getting his own way with the youthful fop. As Constans approached his thirties he started taking more interest in the actual day to day running of the empire, threatening the position of Magnentius. Magnentius was himself a barbarian who had risen to be in charge of the emperor’s personal bodyguard. These were now known as the Jovians and Herculeans in a nod to the distant reigns of Diocletian and Maxentius. His co-conspirator was Marcellinus who was in charge of the money – a key factor in ensuring a successful regime change attempt. It was possible to put forward many convincing arguments why the degenerate Constans should be replaced by the fine and upstanding soldier Magnentius. The troops would no doubt be sympathetic. But hard cash tends to be even more persuasive. The coup was instigated at a birthday party for the son of Marcellinus in the city of Autun. All the top people from the court were there. The wine flowed freely and there was plenty of it. Late, when everyone was suitably impressionable, Magnentius appeared in the robes and purple of an emperor. As prearranged, some of those in the know hailed him as the new Augustus and in the heat of the moment everyone joined in. By dawn, the guards had sworn to support him and the city of Autun was in his hands as was the treasury. Constans was nearby hunting in a forest with his ‘friends’. He got wind of what was going on and wisely fled. But it was too late. He was overtaken by some light cavalry and killed. With his death there was no longer any point in anybody standing up to Magnentius and he rapidly took control of the western half of the empire. A massive donative to reward the lack of loyalty of the troops didn’t do any harm to his position either. But while the population of the provinces had no way to resist the new regime, nor any particular motive to do so, this wasn’t true of the general of the forces defending the Danube. He had to make a choice of which horse to back. He was an oldish guy called Vetranio who seems to have been popular and not particularly ambitious. These two facts may well have been related. Consider the position he was in. Had he come out in support of Magnentius he might have been able to keep his position, though there was a good chance that Magnentius would have rapidly replaced him with someone he knew and trusted. If he had supported Constantius against Magnentius he would have instantly been at war against Magnentius who had a bigger army. Whether or not Constantius would be able to send much support to Vetranio was questionable. Indeed it was not a foregone conclusion that Constantius would not simply recognise Magnentius. Just to make his position even harder to cope with, his troops were up for a bit of rebellion. It had been a long time since donatives had been in fashion, so they probably saw an opportunity for a spot of pocket filling. And then Constantina turns up. She was the daughter of Constantine and the widow of Hannibalanus – one of the cousins of the sons of Constantine killed by the sons of Constantine. Having missed out on one shot at becoming an empress she spotted another. She offered to make Vetranio an emperor. It wasn’t the most solid basis for a legitimate reign – especially with an actual son of Constantine not only available but already actually reigning – but it was obviously better than that of Magnentius. With Constantius’ sister on board there was a good chance of a reconciliation with Constantius himself. So Vetranio became an emperor largely as a result of the actions of other people. He allied himself with Magnentius but was also keen to open negotiations with Constantius. You get the impression his heart wasn’t really in this whole rebellion thing. All eyes were now on Constantius. His main preoccupation up to that point had been the Persians which we’ll see wasn’t showing him in a great light. How would he cope with this crisis? Negotiations opened at Heraclea in Thrace. Magnentius was clearly the major threat. He had the most troops, and it was his initiative that had created the situation. His negotiating position was straight forward. He was in charge in the West and simply wanted mutual recognition. That the legions of the West could conquer the whole empire if they chose was not really in doubt. After all, that was exactly what Constantine himself had done. Constantius asked to sleep on the matter. Overnight he had a dream in which his father appeared to him and told him that his duty was to avenge his brother. The message was sent back to Magnentius via one of his three emissaries. The other two were thrown into prison to indicate that his regime was not considered legitimate. At a time like this when hearts and minds are important, Constantius was showing a good appreciation of the situation. If he was to fight he needed every advantage he could muster, and portraying himself as a loyal son and an avenger of his murdered brother played well with the public and with the sympathies of the troops. But Vetranio was a different case. Could he be won over? Feelers were sent out and the overtures from the camp of Constantius were accepted. Vetranio would be recognised as a co-emperor. This split the opposition, which was neat work. It was arranged to initiate the alliance in the city of Sardica. Vetranio’s 20,000 horsemen and even more infantry vastly outnumbered the troops of the emperor. But events did not pan out as might be expected. A large scaffold had been erected for the leaders to address the troops from. Constantius, given his imperial seniority, was on first. He had prepared well and key individuals in the Danube legions had been won over to his cause beforehand. Vetranio was stood next to Constantius on the platform watching his strength and support melt away in front of him. He lost his nerve and supplicated himself before Constantius. It was a skilful bit of work from the young man, combining planning, organisation, a shrewd eye for an opportunity and a willingness to take a risk. His father would have been proud of him. Next time, we’ll have a closer look at the last surviving son of Constantine.